Famous BMWs took 1-2 at the Pebble Beach Concours this year. BMW AG continued a streak of wins with the unique R7 prototype, beautifully restored by a team of star restoration experts assembled for the project. Last year, as we reported, the R7 won a prestigious award at the Amelia Island Concours. You can read BMW's press release here. 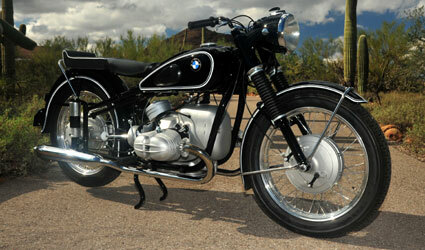 In addition, VBMWMO founder and member #2, Jeff Dean, came second with his beautifully and painstakingly restored 1954 R68. The restoration, carried out by renowned restorer Tim Stafford of San Diego, has been seen at the Quail Lodge Motorcycle Gathering and is absolutely stunning. Another exciting year at Bonneville! They are aiming to set many new speed records. Barbara is tweeting the proceedings as the action unfolds. The East Coast Timing Association (ECTA) held its inaugural event in Wilmington, Ohio on the weekend of April 28th – 29th, 2012. For the last 15 years, the ECTA has run events in Maxton, NC, but has moved to a new location in Ohio. The event was a huge success for the ECTA and the city of Wilmington, selling out well in advance with 175 pre entries. The BMW Veteranen-Club Deutschland e.V. is looking to gather photos, information, history and stories about the famed BMW type 253 rennsport machines. The 60th anniversary of the type 253 RS54 machines, from 1954, is rapidly approaching, and the Veteranen-Club is undertaking a project to put together detailed information about these fascinating but relatively obscure purpose built motorcycles. If you can help, they would like to hear from you. Chicago Vintage Racing Sets New Records! Chicago Vintage Racing (Daniel May and Rebecca Berneck) traveled to the ECTA (East Coast Timing Association) May 2011 meet in Maxton, North Carolina on May 13-15, 2011, with a vision to beat the standing land speed record in the P/PV-250/4 motorcycle class set last October, in addition to setting a new record in the MPS/VG-250/4 class. If anyone is in the Seattle/Tacoma metro area, Kevin and Barbara Brooks will be giving a talk at South Sound BMW on January 22 about their efforts in setting land speed records at Bonneville in their R50/2 and R50/2 sidecar. Word is in that long time vintage BMW rider and restorer, Daniel May and racer Rebecca Berneck, have just set three new top speed records in 250cc Vintage classes. Our congratulations go out to them! The new top speed in the P/PV-250/4 class of 72.08536 mph was set at the Maxton Mile during the October ECTA meet there over the weekend of October 30 and 31 by Berneck. May set records in two other categories with the bike as well. Kevin Brooks and his team at Brooks Motor Works are back at it! They have brought a 1955 R50 based sidecar rig and are planning to capture another world record! The 2nd quarter (Spring) newsletter from the International Council of BMW Clubs (BMW ICC) is now available. Clicking on this link to the Council News 2/2010 will download the english PDF directly to your computer.